Tangy and tart rhubarb comes together with sweet apples in this tasty crisp recipe from Veronica Bosgraaf, founder of The Pure Bar. In her new cookbook, The Pure Food Cookbook, Veronica features easy, clean and seasonal plant-based recipes the whole family will enjoy. 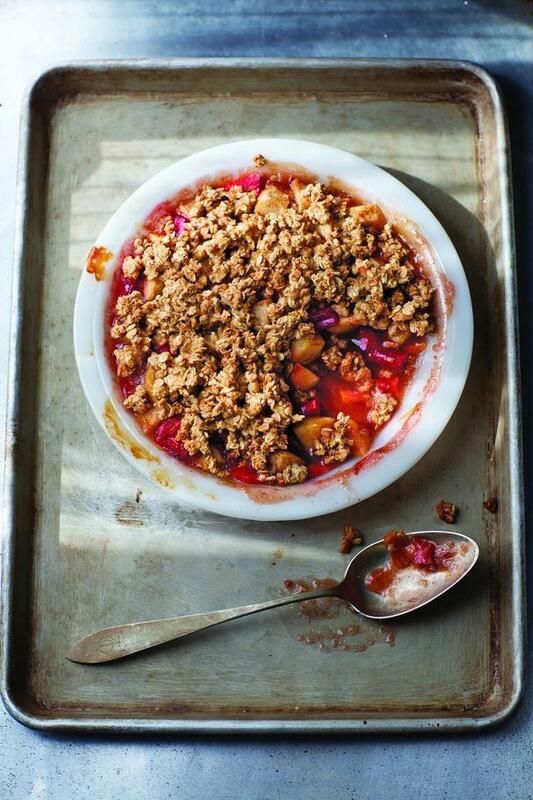 This delicious dish combines two things we simply adore - rhubarb and apple crisp - and it's for breakfast (though we think you could add a scoop of your favorite ice cream and call it dessert, too)! Step 1: Preheat the oven 375ᴼ F. Grease a 9-inch pie dish with grapeseed oil and set aside. Step 2: In a large bowl, combine ½ cup of the applesauce, the maple syrup, lemon juice, tapioca starch, and cinnamon. Add the rhubarb and apple, and toss as well. Transfer to the prepared pie dish, cover loosely with foil, and put the pie dish on a baking sheet. Step 3: Bake until bubbly, 30 to 35 minutes. Step 4: Meanwhile, combine the granola and remaining 1/3 cup applesauce in a small bowl. Remove the foil from the pie dish and sprinkle the granola mixture over the top of the rhubarb. Return to the oven and cook, uncovered, until the topping is lightly golden, about 12 minutes. Step 5: Let cool for at least 5 minutes before serving. Serve hot, warm or at room temperature.